& Spunky Sparrows at Sacred Ruminations. Visit other Mellow Yellow Monday and Today's Flowers posts too. "Earth laughs in flowers." Ralph Waldo Emerson, "Hamatreya"
Beautiful flower collection. Thanks for the lovely poetry. So many beautiful flowers in this season ! I love spring ! Those are just beautiful! I really like those red ones witha hint of yellow! Lovely flowers in your neck of the woods. You've got one of the most interesting blogs I've ever seen on the Internet. I love those flowers! Especially the yellow-black ones. I wonder what they're called. and delight in flowers just like you do. So pretty!!! I've finally got some flowers outside and it makes it so nice to sit out and enjoy them. Thank you for sharing your beautiful haiku along with these equally beautiful flowers...so glad you joined us! :o) Happy Day! How I love to have these outside my window. Enjoyed the haiku. Beautiful collection of yellow, spring flowers !! I can almost smell them !!! Your photography/photoshop skills are really improving--and considering what a high level you started with, that's saying something! Beautiful! 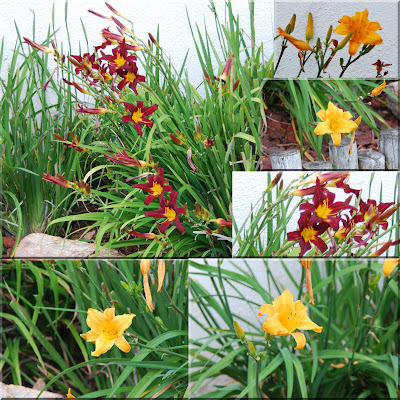 Lovely tiger lillies and haiku! You have a lovely blog! A pretty Haiku and i adore all the yellow flowers. They really do brighten spirits! 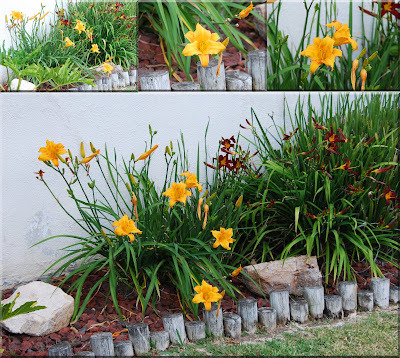 I love daylilies-particularly because they are so shortlived-you have to really appreciate them like blossom as they are gone so soon. Very pretty flowers - So nicely displayed too! So many flowers! So much beauty! Excellent, I really wanted to write a gardening haiku but the words just didn't come, yours flowed beautifully. Lovely, bright, lilies. Love the collage. My lilies are yet to show buds, but it won't be long! Beautiful. My columbine is about to flower. Hope all is well with you. I've certainly missed visiting. How can you go past yellow flowers on a mellow yellow Monday?